Wash and wax your vehicle in one easy step! Save on various surfaces including paint, glass, chrome, plastic, etc. One you are finished you will not only be left with a clean surface, but the hydrophobic polymers & carnauba in the formula, will enhance gloss and leave behind a durable layer of protection. Use Rinseless Wash & Wax on all exterior surfaces,including paint, glass, wheels, door jambs, clear plastic, chrome, trim, rubber, cloth tops and more! For extremely dirty vehicles, Griot's recommends a quick traditional wash first, then following up with the Rinseless Wash & Wax. So what are you waiting for? 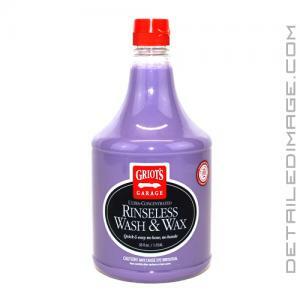 Grab a bottle of the Griot's Garage Rinseless Wash & Wax to combine detailing steps and save time, all while achieving an incredibly clean and protected surface in the process! This versatile, ultra-concentrated formula quickly washes and protects vehicle surfaces without rinsing. We use a unique blend of hydrophobic polymers and carnauba wax which effectively lubricates the surface, guarding paint against scratching while significantly enhancing gloss and protection. Rinseless Wash & Wax is ideal for mobile detailers and DIYer's in regions where hose-and-bucket washing is restricted. It safely cleans all exterior surfaces, including paint, glass, wheels, door jambs, clear plastic, chrome, trim, rubber, cloth tops and more. Useful Directions: Shake well and work on a cool surface. For severely dirty paint, hose heavy debris off first. Add 1 ounces to every 2.5 gallons of water (320:1) in a Griot's Garage Ultimate Wash Bucket. Soak a plush microfiber towel/wash mitt/pad in solution. Lightly wring out wash tool and gently glide over the surface working from the top down and one section at a time. Rotating wash tool often to a clean area. Dry panel immediately using a PFM Terry Weave Towel and repeat on the next section. Frequently rinse wash tool and agitate to release contaminants. Tip of the Trade: Dilute Rinseless Wash & Wax 15:1 in a spray bottle for traditional waterless washing, pre-soaking dirty cars, as a surface prep/clay lubricant or gloss-enhancing rinse agent following normal washing. Such a breath of fresh air for people to go above and beyond.